About £140,000 will be spent replacing plastic chairs with wooden ones in Worcester Cathedral, the dean has said. The Very Reverend Peter Atkinson said the seats were not a fire hazard but plastic chairs were unsightly and had caused soot and smoke damage elsewhere. He said the fire in Peterborough Cathedral in 2001 was put out fairly quickly and most of the damage to the building was caused by soot and smoke. He said no-one had told him to change the chairs but it would be "prudent". Mr Atkinson said as well as the fire aspect, the 900 plastic chairs in the cathedral took up a lot of storage space when not in use and looked unsightly. He said he wanted to replace them with more efficient wooden stacking chairs already in use in St Paul's Cathedral in London and Salisbury Cathedral. "If you imagine the amount of smoke from plastic chairs burning, that's what happened in Peterborough Cathedral. "They were able to put the fire out fairly quickly. 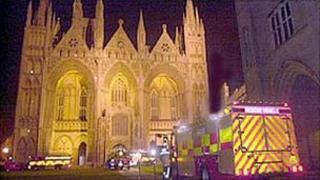 It was the soot and smoke that covered the building and damaged the cathedral. "I should say there were no safety officers involved [in this decision], no-one has told us to do this, it was simply decided when we met as a chapter that we would try over the next few years to replace the seats with wooden ones," he added. Worcester Cathedral has permanent wooden pews and the supplementary plastic chairs are used for big events, such as concerts, school assemblies or Christmas services. Hereford and Worcester Fire and Rescue Service was unavailable to comment but a firefighter from West Midlands Fire Service said a severe fire would produce a lot of smoke and soot damage, regardless of the type of material being burnt. He said plastic did not burn as easily as wood and would therefore produce relatively more smoke as unburnt product. The firefighter said: "You might get one inch of soot instead of three inches with plastic chairs but the building will still be damaged and you will still have to clean it. "It would be better not to have a fire at all and perhaps he should consider investing in fire prevention instead."